and Danielle Lavallee presented at the PCERC workshop on patient engagement in research. Last month, the BWH Biomedical Research Institute (BRI) Patient-Centered Comparative Effectiveness Research Center (PCERC) held a workshop in the Shapiro Conference Center as part of the Patient-Centered Outcomes Seminar Series. The event featured speakers who provided advice and best practices on how researchers can better involve patients in the research process. 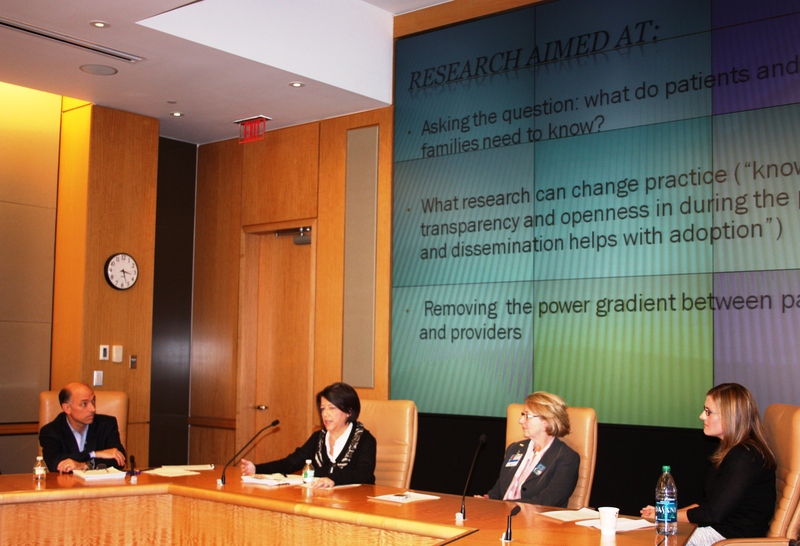 Maureen Fagan, DNP, MHA, executive director of the BWH Center for Patients and Families, and Dena Salzberg, BSN, BWH patient and family adviser, also shared their experiences and views on engaging patients in research. According to Fagan, empowering patients by integrating them as patient advisers in the research process can ground the research by incorporating the lived experience of patient and caregivers’ perspectives of the problem being addressed, as well as assist investigators in refining their research questions. Salzberg shared her experience as a patient and family adviser, stating that advisers serve a vital role aimed at removing the power gradient between patients and providers, which allows a bi-directional flow of information that may lead to an adjustment to the aims or methodology, as well as helping families and patients understand the clinical trials they may be involved in. For those in the audience interested in establishing patient advisory councils within their own research network, Salzberg recommended that the council should represent the diversity of the population being served, as well as ensure that the members are able to understand the research work being evaluated. The Patient-Centered Outcomes Seminar Series sponsored by the BWH BRI Patient-Centered Comparative Effectiveness Research Center (PCERC) brings together patient-centered outcomes (PCOR) and comparative effectiveness researchers (CER) across BWH for the purposes of discussing research findings, methods, and policy related to PCOR and CER.